In 2011, I went to Tahiti and paid an astronomical amount to hop on the resort’s Wi-Fi to check-in on things back home. Actually, I don’t think it was wireless, I think it was dial up. I remember drumming my fingers and waiting for the connection, then watching the slow-as-molasses loading of the images on the page, just so I could send a ‘hey Mom, all is well here…hope things are good there’ email. I remember wondering, “What do they do around here when it comes to business interactions?” Certainly, the slow Wi-Fi would impact the country in all areas, especially marketing and advertising. Fast forward 5 years to this past September. Earlier this year, someone challenged me with “if you make enough money in your business, then you can go back to Tahiti.” Don’t ever challenge a salesperson. Really. We are motivated by success, overcoming obstacles, and the joy of achieving short and long term goals, whether they are self-imposed quotas or landing that new client. I exceeded that goal and then some, not only because I like winning, but because I’m really passionate about, and pretty darn good at, what I do…oh and did I mention I love Tahiti? So, as I planned my 2nd trip to Tahiti, that sales side of me started to itch. What if I could mix business with pleasure, securing a meeting in my favorite destination on earth and possibly pitch my business services to them? The ‘Lindsey Lightbulb’ went off. It’s always on, sometimes it is so bright it can be blinding and I have to slow down and figure out what it’s shining on. This lightbulb moment came from a place deep inside that I cultivate quite often – continued education. Seeking out and taking time to understand subjects is so vital to me, personally and in my business. I am curious about why things work, why people do what they do, and how they do it. I thought, Tahiti isn’t cheap. I’m investing a sweet chuck of change to get myself out there, but what about those who live there and oversee marketing strategies in order to entice people to come visit. What does the tourism industry look like for Tahitians? How do they market to tourists? I picked up the phone and cold called the Regional Director of Sales and Marketing for InterContinental and asked for a meeting since I was going to be out there. Just kidding. I didn’t do that. I would’ve done that in my early years of selling, when I didn’t take the time to prepare for the first interaction with a decision maker. You know that feeling you get when you’re cold calling and you don’t think the business owner is going to pick up, and when they do you’re all thrown off? Yeah, that’s what I didn’t want to happen! What did I want from this meeting? Did I want to earn their business as an advertising agency? What do I think their obstacles are, in order to position my services? After considering those questions from all angles, I decided this: I do not want to pitch my services to this company. And I am 120% fine with that. It’s okay to want to meet and not pitch your business. I was even asked candidly from the Regional Director of Sales and Marketing, what did I expect in return? I was honest: nothing more than the opportunity to meet with someone who is in my area of expertise, in the most beautiful place I’ve ever been to, discussing my favorite subjects: marketing and advertising. To me, it was like a young and upcoming boxer getting to meet Manny Pacquiao. Or a music student having the opportunity to be in the same room as Wu-Tang Clan. [insert your own analogy with what you’re passionate about and who you look up to or aspire to be because I was aspiring to do the great things Tahiti was doing in marketing their country]. We don’t talk about this much as salespeople and I’m here to tell you as someone who identifies herself as a tenacious saleswoman … it’s quite freeing when you can look at meetings this way. It’s totally fine to say, “I’m not here to pitch to you. Actually I just want to learn about your business.” And for that to be the truth. This is what the taxi line looks like in Bora Bora (they don’t have Uber yet). Germono Advertising Company launched in December 2013 as an advertising agency specializing in traditional media planning, purchasing and management for businesses in the Norfolk , VA market. Germono Advertising Company also offers marketing coaching sessions to companies of all sizes. Recently, the company released Drop and Give Me 20, a podcast that shares the stories of successful military business owners. 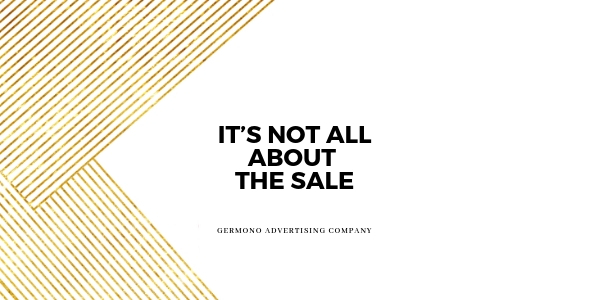 For more information, visit www.Germono.com, like the Germono Advertising Company Facebook page or call 757-777-3780 to learn more. You can also follow via Instagram.